This was our 3rd Grand Canyon Rafting Trip. 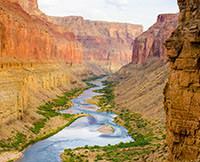 This was our third trip with Western River Expeditions in the Grand Canyon and the guides get better than ever. Our trip leader, Craig, was great and he lead a great team-they were incedible.